I have an office in my home that seems to be the place where everything goes during the holidays…you know, the place where stuff goes when the holiday decorations come out? After all the holiday “stuff” was put away this year, I discovered that not only was this room holding my day-to-day décor during the holidays, it was also home to a mountain of paperwork, left over computer equipment, items that just didn’t seem to have a home anywhere else, but too important to toss. I know how to organize, but I’m a serial procrastinator (not my fault, my Dad bequeathed this trait to me…). I decided to start the year with a clean slate and organize the room. By the way, I didn’t try to remedy the situation in one day as that can be overwhelming. The time had come! Enough! I finished the room last week and had such a sense of relief that I didn’t have to face it again in its current state of disgrace. Here are some things I did and other things I recommend based on the knowledge I’ve gained working with Mark (owner of Consolidated Office Systems) and his ability to put together systems for organizing just about anything. These ideas can be applied to either your home or your office. Is the information still relevant to my life? How easy would it be to replace if I needed the information later? What is the worst thing that could happen if I got rid of it? From there, create piles of “look alike” documents (all tax documents, all receipts for large items purchases, investment documents, car information, insurance information, etc. ) Try to limit the categories or you’ll end up with too many file folders with limited number of documents in them. Separate the documents you want to dispose of into two piles. Documents you can recycle and personal information that needs to be shredded. If you end up with bags full of personal information, like I did, call a shredding service to pick them up instead of trying to shred them one document at a time. Note: Here’s a little hint to cut down on the mail that comes to your house that you will never need. I have a recycle bin in my garage, so when I pick up the mail from my mail box, I go directly to the bin and toss what I don’t need. Now you’re going to need some supplies/equipment. I’m lucky because I already have the filing cabinets, folders, pockets, labels, etc. 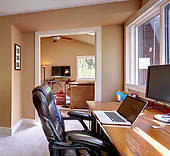 at home thanks to Consolida ted Office Systems. If you don’t have what you need, give us a call or leave a message here and we’ll set you up with the right products for your particular needs. 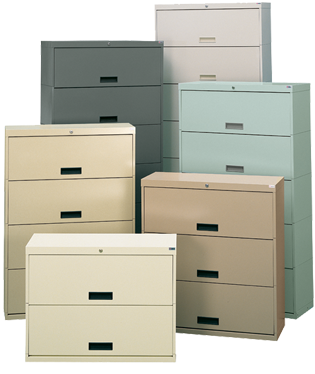 Create a folder, pocket or envelope for each document category, label them and file them in either a fire proof safe or filing cabinet, depending on the documents. The last thing I did was take everything else out of the room that had not been used over the last year and made a trip to the local dump. I didn’t really have items to donate, give away or re-purpose..but keep that in mind for your own decluttering. Remember that any computer equipment you’re tossing will need to be disposed of appropriately. I then organized what was left in the room and realized I had a nice, beautiful space to enjoy and spend time in. My “disgraceful” room had just gotten a little more grace. I realized that what I had procrastinated doing, took just a short period of time to remedy. Now it’s your turn. Let me know how this system worked for you! 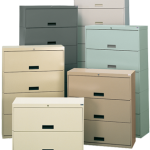 to help with filing systems and supplies! Help, We Ran out of Storage Space! This is an issue we frequently hear about, especially when you consider how much we pay per square foot for rent in California. It’s always a toss up; ”how much room do we have for the people and where do we put all the stuff we need to store?” You can’t stack the people one on top the other, but you can go vertical with your storage or filing systems and save the extra floor space for more important things, like productive employees. Here is a story that may help you consider changing your storage systems. The Hopkins County Clerk of Courts office had 26 vertical files they used to store registration cards for license plates. They moved to a new building but were provided limited space for their registration cards. The solution was to replace the 26 vertical files with seven, 92” high Ez2 Rotary Action Files. Instead of expanding out, the units expanded up, using up the vertical space in the room. The system also provided multimedia drawers to organize the registration cards, making them more accessible. The large top drawers were installed for archive storage that did not need to be accessed frequently. It provided the right solution (more efficient) for what was being stored. It provided additional storage for the registration cards on a go-forward basis. It provided 37% more floor space allowing room for growth in more productive areas. 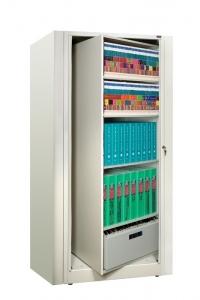 All of the above is provided at no additional charge, if you purchase the new storage systems from us. Story courtesy of “Profiles of Success” from Datum Filings Systems, Inc.
To Cubicle or Not to Cubicle? So you’re moving to a new location and trying to decide whether to go the cubicle route or use free standing desks. Each has their own advantages and disadvantages and it really depends on the type of work your employees do. Cubicles do provide employees with barriers from some noise and visual distractions which allows for better concentration. They also offer a certain degree of privacy, along with the impression that each employee has their own dedicated workspace. Cubicle walls also offer more space for shelves and make it easier to post calendars, notes and memos. 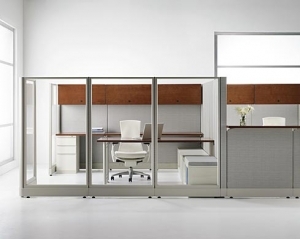 Cubicles have been known to decrease person-to-person communication, leading to frequent complaints about isolation and even potentially low employee morale. If not done well, they can be bland and have been the subject of ridicule in comic strips such as Dilbert and movies such as Office Space. What Do Your Employees Actually Do? If your employees spend the majority of their workday on the phone conversing with clients or the general public, going the cubicle route might make sense, as the space provides the quiet needed to conduct private conversations. For instance, employees of an auto insurance company can most likely sit in a cubicle environment. If your employees spend the majority of their days on their computer and have little or no need to be on the phone, an open workspace plan might be a better approach. If you’ve got a team of artists or designers who frequently work in collaboration with one another, an airy, open workspace approach may work better. Not only is the aesthetic more inviting to creative types (who don’t enjoy being literally boxed in) but is also gives employees the freedom to collaborate on projects. Many employers (themselves housed in private offices) think the cubicle setup drowns out all sounds of chatter and noise. Unfortunately, this isn’t the case. One important issue that rarely is considered when cubicles are installed is the quality of the ceilings and floors in the office. Acoustic floor coverings and ceiling panels should be essential parts of a plan to reduce office noise. Think color. In today’s world your options for laminate, paint color and fabric are almost limitless. Including a splash of color in your cubicle setup is bound to brighten not only your office but the outlook of the employee sitting inside it. If you can, include your employees in some of these decisions so there’s no “buyers remorse” when your employees are having difficulty working in their new space because they were not asked about their needs. 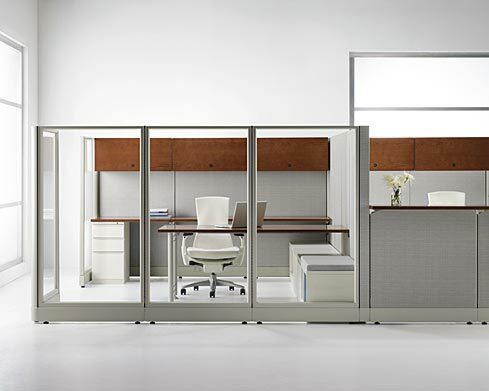 Making changes after cubicles are installed can lead to additional unplanned costs. Consolidated Office Systems is fully prepared to help you make these decisions with our vast background and experience in helping others create comfortable and esthetically pleasing workspace. We work with you to determine your needs and then design the space and create floor plans taking all of the necessary information into consideration. We have multiple lines of workstations and will help you choose which one will work best for your line of business and the type of work your employees do.